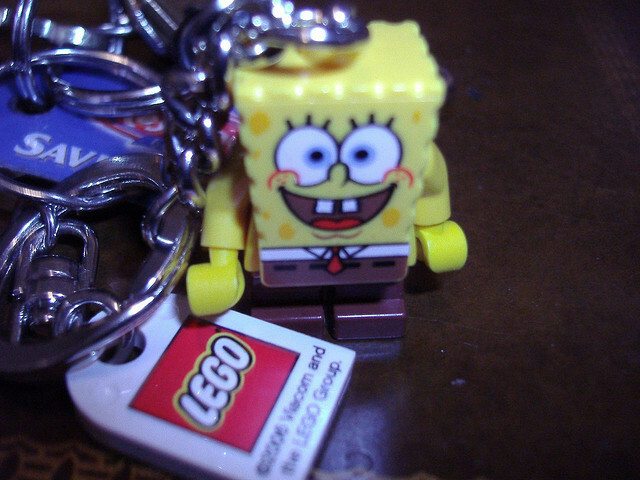 My sister has a LEGO minifigure attached to a key chain, but she wants to remove it from the key chain, how can she do this? Most of the key chain minifigures are standard minifigs that have a large pin with a ring on top running through the top of their head into their torso. This is straightforward. You can use a large pair of linemen's pliers or something similar to make the cut. You could also use a hacksaw of some kind. The main disadvantage of this method is that the head will still be permanently attached. Pulling it out is a little trickier. One method is to put something through the ring (such as a paperclip) and then pull hard to try to remove the pin. The pin is ribbed, so this could be difficult. This can be made easier by heating the pin first (perhaps with a soldering iron as TheBrickBlogger suggests) in order to slightly melt the plastic surrounding it. Is there a way to re-tighten a minifigure's hip joint? Are all the Magnet minifigs now glued on and how should I remove them?